Saying "good-bye" to a beloved animal companion is life-altering. Mourning the loss of the pet can be devastating and overwhelming. 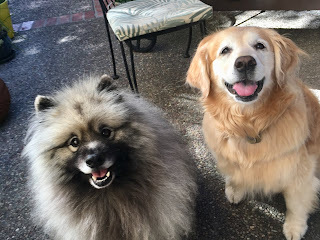 In the past couple of months, my dog Bodhi Bear and I have said "goodbye" to our two dear dog friends that we affectionately refer to as our DFFs or "Dog Friend Furever." 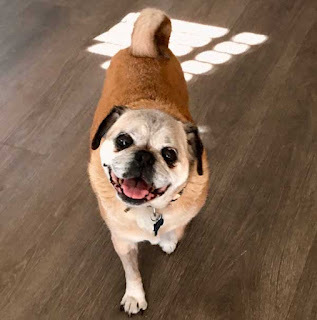 MacGuyver the Puggle left in June. A couple of weeks ago, Sabrina Renee the Golden Retriever also transitioned home to Spirit. Needless to say, we miss our DFFs a lot. One reason why we grieve so deeply for our pets is the unconditional love and acceptance we share with them. It's essential to deal with the pain and sadness because avoiding the grief can be far more debilitating. Not dealing with your grief can prolong your suffering. If you didn't love your pet so much, you wouldn't grieve so deeply. In other words, the intensity of your grief reflects the depth of love you share with your beloved animal companion. When I suddenly lost my Kobe Bear over five years ago, I was overwhelmed with grief. His death rocked my world in ways I never fathomed. The silence without him was deafening, and my heart was shattered into a million pieces. It took at least six months for me to recover from Kobe's death despite getting my new puppy, Bodhi Bear three weeks after Kobe passed. It helps that I can communicate with Kobe and know that he's okay and is always with me as my Heart Dog. 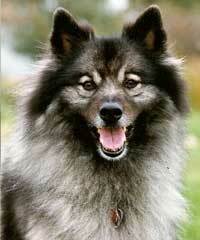 I had an even harder time when my first Keeshond, KC died in 2001. My grief was debilitating, and I didn't totally recover from my loss until I adopted Kobe Bear over a year after KC's death. To this day, I miss my two dogs tremendously even though I continue to talk with them telepathically. Losing KC almost 20 years ago is the main reason why I continue to help pet guardians cope and deal with their heartache and anguish. When KC died, he conveyed to me from Spirit that I needed to put my Master's degree in Counseling to good use by offering Pet Loss and Grief Counseling. KC, who is a benevolent being, inspired me to help relieve the suffering and sadness. KC explained that when I give animals in Spirit a "voice," it helps pet lovers understand that their animal friends don't die. Only their physical bodies cease to exist and will return to Mother Earth. As Spirit, animals live eternally through our hearts and therefore never really leave us. Here are some suggestions to help you or someone you know to overcome the loss of a pet. Be kind and loving to yourself: this is what your pet would want. Give yourself permission to cry and grieve. When you keep your emotions bottled up, it's not good for you as it blocks the flow of energy. It's better to release your tears as they arise. Share your experience with those who understand and honor your grief like with close friends and family who can offer you love and support during this challenging time. Tell stories about your pet whether verbally, in a journal or by creating a photo collage. Memorialize and honor your pet with a memorial celebrating their life. Volunteer at a local animal rescue organization or shelter. Put a pet food drive together or collect towels for your local animal shelter. Donate to your favorite animal organization in your pet's honor. Give your deceased animal a "voice" during an Animal Communication Session. It takes time to recover from the death of a pet so be kind and patient with yourself. The amount of time it takes for your healing varies depending on you and the nature of your relationship with your animal. If you are having trouble moving on, it's important you reach out and ask for help from a Pet Loss Grief Counselor like myself. There is no need to grieve and mourn alone. Help and support are available. Email me to set up an animal communication phone session to find out how your deceased pet is doing. And don't forget to ask if they're planning on reincarnating as your new animal companion.